After a long fight against cancer, today the vet relieved the degu "Hoss". He managed to bravely fight his disease for month, and had more time than anyone expected. Until last week, he was doing good and lived an almost normal degu life with his comrade "Kiwi". Despite his left foot was full of cancer, he was the leader until the end. Suddenly it went bad really fast. This morning he couldn't stand anymore and barely breezing. The vet hurried that he doesn't had to suffer any longer. He had his 5th birthday on September 24th. A big fighter, he didn't give up. 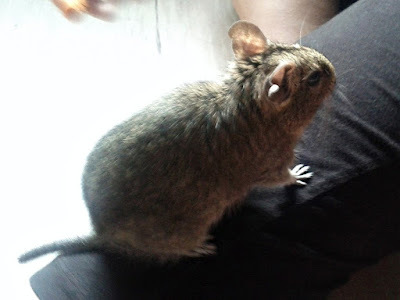 A brave degu that will always been remembered.